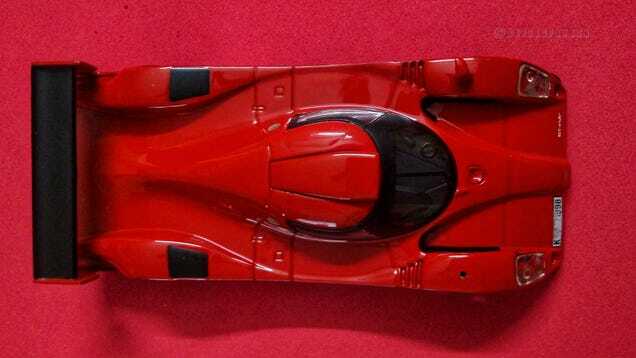 The Toyota GT-One is one of the special cars in my collection, ticking off most of the boxes on my check list - the scale, the car type and the back story. The 1990s were the golden age of the modern Le Mans race. Manufacturers went nuclear trying to sneak around the Automobile Club de l’Ouest’s homologation regulations for the GT1 class. As a result, weird prototypes roamed the grounds of the famed Circuit de La Sarthe, with homologation requirements spawning equally weird supercars for the road. Born out of the realization from Toyota that their heavily modified Supras and MR2s couldn’t just keep up with the GT1 cars from their competiton, i.e Porsche and Mercedes, the GT-One was created by Toyota’s Cologne based European subsidiary in collaboration with Italian chassis specialists, Dallara. And while the GT-One’s development happened, Toyota took a gap year and sat out of Le Mans in 1997. Toyota’s clever reading of the rules meant that they only had to build 2 road cars to satisfy the Le Mans’ homologations rules for 1998. And the loopholes that Toyota exploited (as did their competition) meant that this GT-One road car was virtually identical to the Le Mans entries. The 1998 GT-One were designed to be extremely competitive thanks to Toyota’s observe and learn (from the competition) strategy during their off year. Sadly though, this did not translate into mind blowing results when they finally showed up to race at Le Mans. Despite a strong showing in qualifying where Toyota’s trio of TS020s made the top 10 in both 1998 and 1999, a mix of accidents and reliability issues meant that only 1 car took the chequered flag in both years, finishing 9th and 2nd overall respectively. In 1999, the sole remaining T020 fought until the last hour of the race, ultimately finishing 2nd (and one lap) behind BMW’s overall winner. And that was small consolation because Toyota pulled out soon afterward to concentrate on their ill-fated Formula One campaign. This model is by Altaya and has no moving parts. I had this model on my evil bay watch list for a few months until I found listed on an Indian hobby site (shout out to Scaleartsin) listing it at almost the same price. And I jumped on it. Some packing issues meant that it showed up with a tear/crack in the packaging meant that the model showed up with a missing rear-view mirror. Aah well. Once I figure it out, I will ensure that it gets a new rear-view mirror.